With its swift, darting flight and predilection for lungwort (Pulmonaria spp.) flowers, this attractive bee is commonly encountered in private gardens in southern England in the spring and early summer. Sexual dimorphism is strongly pronounced, the male being clothed mainly with bright reddish brown hairs, the female entirely black-haired, except for reddish orange scopal hairs on the hind tibia. Throughout much of England and south Wales. It also occurs in the Channel Islands. Widely distributed in Eurasia, from Britain east to China and Japan, and south to North Africa. This bee is not considered to be threatened. The male (above left) is brown haired with extensive cream coloured markings on the face and long hairs on its mid tarsi (arrowed). 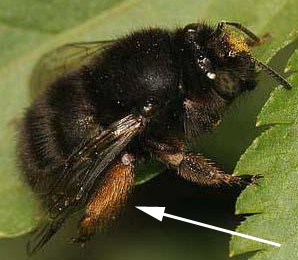 The female (above right) is all black with orange hairs on its hind tibia (arrowed). 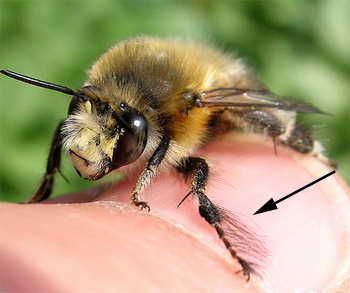 Note - the hind tibia can appear to be differently coloured if the bee is carrying pollen. Almost ubiquitous, including gardens, open woodland, and coastal sites (especially in the vicinity of soft rock cliffs). Univoltine, generally from March to late May, but there are a few records from February, June and early July. Polylectic, foraging from species in the families Berberidaceae, Boraginaceae, Fabaceae, Iridaceae, Lamiaceae, Liliaceae, Papaveraceae, Primulaceae, Rosaceae and Scophulariaceae (Westrich, 1989). However, it has a strong preference for Lamiaceae. Usually nests gregariously in vertical soil profiles, such as coastal cliffs and, inland, in sand pits, soft mortar joints and cob walls. Such sites are used annually, so that with time and erosion old cells are occasionally brought to the surface. Individual cells are pitcher-shaped, the walls and closing lid being fashioned from compacted soil which is almost certainly impregnated with a secretion from the Dufour's gland. When excavated the cells can be readily extracted from the surrounding substrate. Both sexes pass the winter newly emerged in their sealed cells. Nest construction and provisioning is described by Malyshev (1928) and Lith (1947). Müller, Krebs & Amiet (1997) illustrate both nests and their contents. Aubretia, Azalea, borage (Borago officinalis), cabbage (Brassica oleracea), daffodil (Narcissus sp. ), gorse (Ulex sp. ), ground-ivy (Glechoma hederacea), herb-robert (Geranium robertianum), ivy-leaved toadflax (Cymbalaria muralis), lungwort (Pulmonaria spp. ), primrose (Primula vulgaris), Rosemary (Rosmarinus officinalis), violet (Viola sp.) and wallflower (Erysimum sp.). In Cambridgeshire, A. plumipes is an important pollinator of cultivated, autumn sown varities of Vicia faba (Bond & Kirby, 1999). This is the common host of the cleptoparasitic bee Melecta albifrons (Hallett, 1928; Lith, 1947). Parasitoids of A. plumipes are the eurytomid chalcid Monodontomerus obsoletus and an unidentified eulophid chalcid in the genus Melittobia (a hyperparasitoid of the M. obsoletus larva). Females of the bee-fly Bombylius discolor have been seen about the nest burrows of the bee in Devon (Turner, 1972), and thus this fly may prove to be a cleptoparasite of A. plumipes.